But, nature, where is your law? From midnight countries a dawn is rising! Is there the sun building up its throne? And ices thrust the sea of fire? The cold flame has covered us! Beyond the night the day came in on earth! 2. Detonation of water. Oil-water. Options for applications of little-known physical process. 3. Design. Principle of operation. Refuelling, fuel, briquettes. 4. 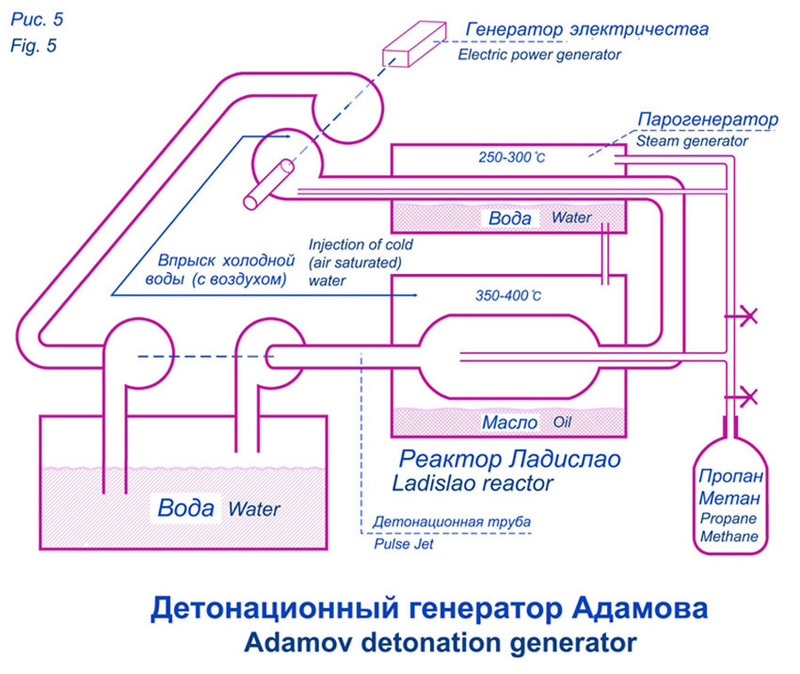 Development of the idea – Adamov generator. 5. Pyrolysis – a practical option. 6. Crowning idea – Adamov detonation generator. 7. Conclusion: 1,000 British pounds versus Revival of homeland – Russia. What about the girls? (or the money)? All the rest is later on to come. In order the article avoids too excessive creative surplus and tearful stories about the difficulties and unrewarding destiny of researchers, especially since I 'm not in the strict sense, neither scientists nor the researcher – I will report on the work done in acquisitive military manner. 1. Combustion, explosion, detonation – these are nuclear reactions, during which there is a slight defect in the mass of oxygen, fuel is a catalyst for the reaction. Therefore, you need to pay more attention to the preparation of the mixture and the method of interaction. 2. The reaction is the more effective the higher the speed of the process, which in turn depends on the concentration and temperature of oxygen and hydrocarbon substances. This means – to combust is more profitable than to burn; and to detonate - better than to combust. «Poor» mixtures detonate. 3. Fuel should be heated as high as possible; air is maximally cooled and, preferably, pre-compressed. 1. Boost of “cold” air to the hot fuel - forging furnaces, blast furnaces. 2. Bubafonya oven - fresh air supply in self-flow manner onto overheated fuel surface with automatic-mechanical movement of the piston-chamber as fuel burns out. 3. Injection of fuel into the compressed air (diesel) and the next technical step - pre-chamber fuel activation. 4. Detonation of atomized fuel in a diesel engine (Toskin diesel). 5. Detonation of atomized fuel in the air (vacuum bomb). It should be noted that Russian scientists, as usual, have better understanding of these processes and therefore our Dad-bomb surpasses their Mom-bomb at times. Long live the Russian science! 6. Detonation of an oxygen cylinder from a negligible amount of oil. 7. 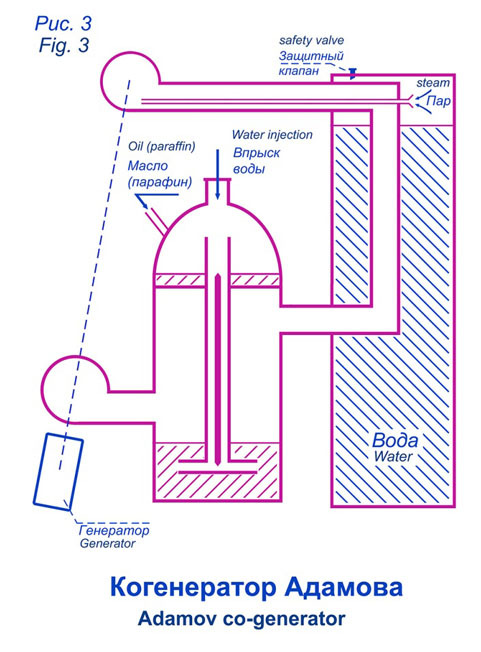 Supply of oil and water superheated mixture in a stream of forced air (Turbo&heat generator by Arakelyan). 8. Development of Elsbett company. 10. Work of Pulse jet with heating fuel. Step by step, researchers and technicians are intuitively approaching to the basic formula of burning (Ponurovsky) cold pressurized oxygen, plus pulse injection of superheated fuel or vice versa - forced feed of cool air to the heated oil. Intuitive picture by no means is a science; the science is numbers and law patterns. · Toskin mixture is poorer THREE times (at the same power gain?). · Dad-Bomb is FOUR times efficient (by what means?) than Mom-bomb. · Does detonate a portion of 10g of oil or 40 kg of oxygen? · Arakelyan claims, the generated thermal energy exceeds the fuel calorific value many fold. · More fun with guys dealing with Pantone reactor. Water in burbulator (water pipe, moof) does not decrease and is not heated above 80°C (this happens in a closed plastic utensils in contact with a portion of the exhaust), and the engine, and surprisingly to us and by the testers, able to puff without access of air? · What comrade Adam features is that during the injection of cold water the burner “detonates” and whitens, clearly pointing to the times increase in capacity. This process is an insufficiently studied physical phenomenon that requires special attention because of the unique position to significantly increase the efficiency of combustion. When spraying cold water on overheated oil (above 300°C) the explosive vaporization occurs with the release of excess energy, exceeding several times the oil heating energy. Reference to the original - a method of producing thermal energy (Ladislao). But understanding the on-going process comes after a detailed study of Ponurovsky inventions, in particular, the method of fuel regeneration. Thus, under the leadership of Comrade Adam with the money of my brother Artyom Adamyan and with the technical and engineering support of great Soviet expert technologist Kostandyan Climent, my uncle, we have been conducting long smelly and dangerous experiments and measurements. Results and conclusions: The physical process of interaction is definitely not heat exchange but an explosive reaction of enormous power at the flow of steam at 170-180°C. Rough efficiency measurements show: the energy of steam exceeds the energy of heating 2-3 times without thermal insulation of the chamber. According to the description of the invention it should be as great as up to 10 times. Meanwhile there is a small problem: when heating above 250°C the emission of pyrolysis and semi oxidized corrosive gases occurs. With injection of water, at the beginning of the reaction, the oil mist is observed (oil leak from the reactor). Without heating, the reaction quickly fizzles (in about 5 minutes). By lowering the oil temperature below 220°C it stops and the injected water is accumulated in the reactor. To control heating and injection is difficult. Considerations: The limit heating temperature of 300-320°C, indicated in the description of the invention of Ladislao has two reasons: higher temperatures cause spontaneous self-combustion of oil, and if you block access to air - oil degradation (pyrolysis) starts. At the same time for such reaction (spraying cold water on in the superheated gas environment in order to get maximum results - the destruction of water molecule) – comrade Ponurovsky has recommended temperatures up to 550°C. In our attempt to raise the temperature of the reaction we got the fountain of mixture of water steam, oil mist and corrosive gas together with the reactor having caught fire. The entire territory becomes covered by an oil film, and the neighbours call the fire department. Usually after such ugliness healthy ideas are being born - no need to suffer frail, European, green idea – a fire-free energy. We are red (true colour of life and health), and there is no need us to avoid the passion and the fire and the fight. Therefore, it was decided to curb and control this explosive process in fire. The reaction products themselves (steam, oil mist and pyrolysis gases) do not burn, but being supplied to a strong fire cause rapid (almost explosive) strengthening fire, both by temperature and power. The idea was born and it was beautiful - a hybrid of the stove with a boost and great energy process of explosive interaction of cold water and superheated oil. 1. Ladislao reactor is placed inside the burner in the form of the top cover with the spray device. 2. Pantone Reactor in a shape of pipeline. 3. Stove – boost burner operating on coal, wood or briquettes and equipped with a convenient channel to add fuel. 4. With moderate boost operates in the mode of oven. 5. With an average boost operates in the mode of burner. 6. Strong boost will allow the second turbine to gain extra energy – Adamov generator. Important note: autonomous electricity, featuring both affordability and a practical device is an unsolved problem. 1. Diesel or petrol generators are noisy, fuel is expensive, demand maintenance and cost of energy produced is much higher than the power supply from network. 2. Solar, wind - do not have the necessary capacity, dependant on weather conditions and very expensive. 3. Turbocon has interesting developments (no commercial development project). 4. Indigirka oven - expensive, low power. 5. Whirlpool hydro station - very promising for mountain streams, but not suitable for households and cities. 6. Mini nuclear plants – too exotic. 7. Fuel cell technology development has good prospects, but is not fast and not widespread. Electric Power generation yield of 10-20% of the heat by burning fuel will be a small revolution - handy, free electricity. The main condition - not to complicate the equipment and to keep the affordable cost of power received. Observed and verified - the oil-water mixture, if it enters the environment of high temperature, explodes (clicks), which is the equivalent of a process described in the invention of Ladislao. 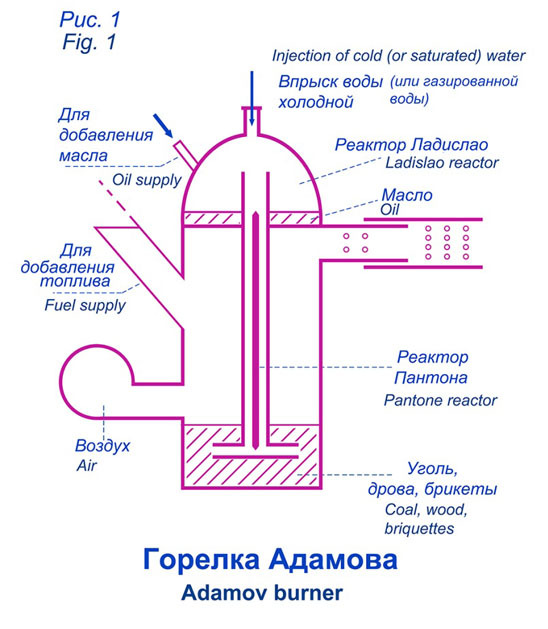 Combustion in the furnace of Adamov is like combustion in the Bubafonya furnace: layered combustion (top to bottom) Therefore for the public version of the recovery furnace it’s better to implement simple addition of the mixture instead of complicated injection. Designed and implemented in the Soviet way - cheap, reliable and practical. Three Soviet engineers have worked on the project, Soviet machines and metal used. Refill. Recommended fuel composition and sequence of filling. 1. Mixture: mixed wood and waste (paper carton packaging, rags, rubber, leather, organic, agricultural waste). If the oven loses power (typically with low caloric and in a few hours of operation) it is required to add wood or briquettes. 1. Processing and recycling of solid waste with the manufacture of solid and liquid fuels. 2. Manufacture and sale of stoves, generators and fuel briquettes for them. Disposal of products of human activity is more important than a ballooned problem of non-ecological hydrocarbon energy generation. Thesis of finality and dead-end for hydrocarbon energy is fundamentally flawed. Abiogenic origin of hydrocarbons is more complete and system presumption, thus the absurd to be touched by pricked windmills and solar energy projects is same ugly as to give up the use of meat and clothing made from natural (animal) materials. What, in this case, should be considered more harmonious, natural (environmentally friendly) is a matter of taste, traditions and worldview. But it’s neater and more efficient - to burn - is long overdue. Please pay attention to the clean exhaust engines working with Pantone reactor, Pulse jets with heated fuel turbo&heat generator by Arakelyan, and finally a series of inventions of our compatriot Ponurovsky. Let’s apply his invention “fuel reprocessing method” to the pyrolysis process, but utterly simplifying the design for convenience. 1. Let’s refuse to close the reactor with dozens of nuts - it is a long and inconvenient process. We will make an easily removable hatch. 2. Let’s refuse to unload the reactor through a tap to wait for cooling and let’s attach the lower hatch for cleaning the reactor from coal and ash. 3. Let’s add carbonated water injection (dissolved carbon dioxide). The method of Ponurovsky works - all necessary conditions are there. 5. Let’s make the door in the outer shell of furnace to open lower hatch and to ensure convenient cleaning of ash. With injection of water with carbon dioxide in the pyrolysis reactor preheated to 550°C, which releases pyrolysis gases (a mixture of hydrocarbons, water vapour, carbon dioxide, etc.) we will obtain even a triple effect. 1. Additional thermal energy (Ladislao). The hydrogen from dissociated water (oxygen reacts immediately with hot hydrocarbons) passes the condenser and is burned in the furnace. 2. The resulting vapour (water is not dissociated in full volume) has beneficial effects on the pyrolysis process (known fact). 3. 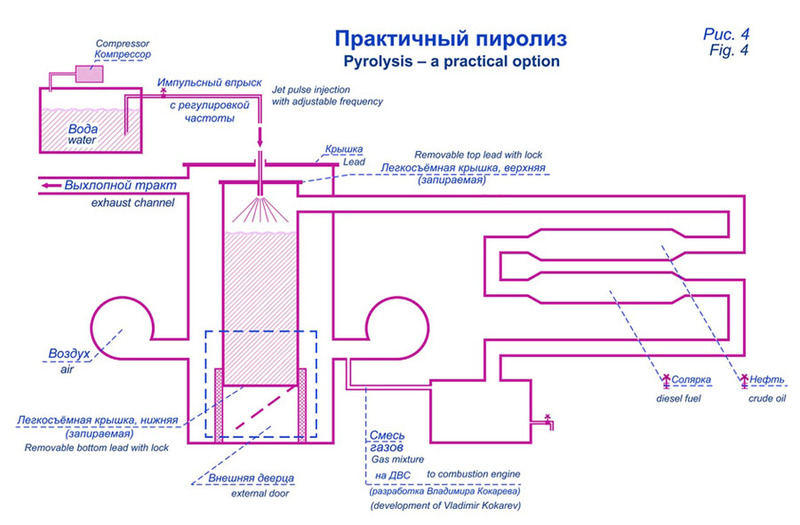 At the final stage of pyrolysis, when predominantly carbon and ash remain in the reactor, that same steam will clean reactor, converting carbon dioxide into the synthesis-gas. This demands to raise the temperature of the furnace. 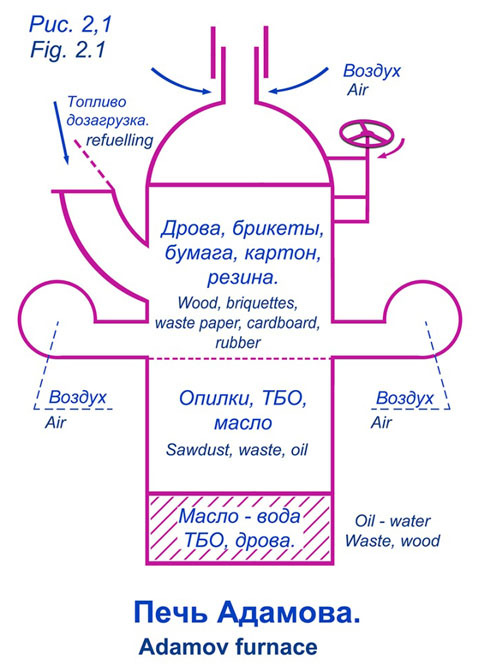 Improved outgassing will make the use of the pyrolysis method for diesel engines to operate in the gas-diesel mode (design by Vladimir Kokarev) especially attractive and structurally complete solution for a wide use in the national economy. An ideal place for such installations - suburban greenhouses, where, according to the author, school and college students have to work, gaining real-life experiences, knowledge of nature and the cycle of all processes. One can go ahead and make the pilot project of a complete self-contained village with independent from the outside world economy its internal energy, heat and water supply, environmental production and lack of garbage as such (full utilization) and certainly safe - we no longer need communist constructions with poor people. It is desirable to combine this idea with an urgent revival of Russian peasantry in alliance with the Cossacks. Here lies the basis for sustainable development of Russia – the only one and unique Mother, homeland for all the people talking and thinking in Russian, those who feel kinship with its culture and traditions, multinational, yet definitely Russian community. The idea is the best independent generator with the ability to produce heat, electricity, steam and distilled water. Highest power, clean exhaust, the maximum fuel efficiency at lowest cost per unit of power. This is a fairly tech design and I cannot win this task on my own – there is a need for technical and material resources, and, most importantly, associates, so the description of the idea is a short and intriguing one. 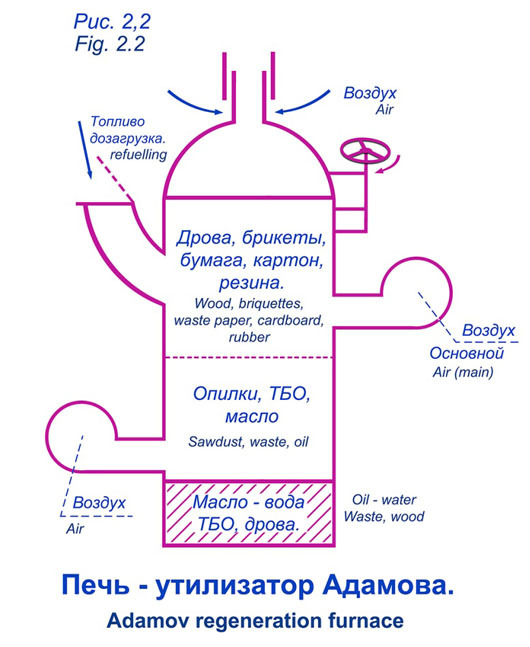 The most efficient combustion, “costless steam”, double turbo boost (Adamov's idea), the recovery of fuel - a new type of co-generators and tri-generators. Explosive, partial (or full) decomposition of water at combining of different temperatures substances, into its constituents, hydrogen and oxygen is the essence of Ponurovsky inventions - is an either ignored or misunderstood energy revolution. Supporting evidences: Pantone reactor, turbo&heat generator by Arakelyan, Ladislao reactor, and finally, a cheerful folk fun - hot water freezing in the frost (cold water doesn’t freeze as quickly) - the so-called “Mpemba effect". Paradox (unexplained) essence of this phenomenon is troubling the minds of the “enlightened” humanity to such extent, that the Royal Chemical Society has established a prize of £1000 for an explanation of this phenomenon. This humiliating amount for millennial paradox discovered shows us the diametrical difference between two worlds: the World of Spirit, Will and Knowledge and the vain world of money, freedom and fun. Yes, the whole World and the Universal nature is dualistic, contradictory and due to this - dynamic. Any process encompasses war (interaction) of opposites. And it is so natural that the hot and cold are at war, causing the same time an explosion (dissociation) of substances. So naturally, without us - “total woodheads” - there would be no world of “digital idiots”. And it is same natural to look for answers to the paradoxes in Russian Notions in Russian language, and then to split details and to apply to application in English and German. The answer to the millennial paradox in Russian is laconic and understandable in all languages. The interaction of hot water and cold air results in water (partly) dissociated into hydrogen and oxygen with the release of the cold that is the reason for of the instant freezing of the rest of the water. After the experiments, we have arrived at the following figures: weight of water before and after interaction was measured by syringe injection of boiling water in liquid nitrogen (our high-tech). After collecting the pieces of ice from a thermos, where reaction occurred, and a smaller part from gauze, which obstructed the fly of icicles off the reservoir, the mass discrepancy observed was about 7-10%. Low accuracy of measurements (we did not bother much about top accuracy) does not affect the proof - water cannot disappear in nitrogen in no other way than gaseous form of its components – hydrogen and oxygen. Emanating of cold is also obvious, cold reservoir (plates) which is usually covered with a light frost, freezes after process for a long and is not coming off. Cooling capacity of nitrogen (about 3 litters) is lower than the cold obtained (500g of ice at minus 80-100°C) Nitrogen evaporates (and has evaporated) at a temperature of -196°C. That is, the phase transition from liquid nitrogen to gaseous nitrogen should ensure boiling water to freeze to ice at minus 80°C. · New furnace with fuel economy increased several times. · New standalone clean energy, so necessary in the vast expanses of our country, and not only our one. · Solution of global problem of water, food and affordable transport worldwide. But what about oil freebie, budgets and our relative prosperity? Answering with the question - what happens to oil and its products which are sold so expensive (something like four times higher than their cost)? The answer is simple - the world economy (return on human activity) – is not 10, but 100, or even 1000% (sow one seed and get a dozen, invent a tractor - replace hundreds of horses, flying plane is a thousand times faster than a horse). That’s why those who became richer (and the most importantly – develop) not those who sell raw materials, but those who buy, process and go forward through knowledge and advanced technologies and are using oil and money as a means for progress and development. (Best experience is German, which has its closest kins in the East - in Japan and Korea). With these comrades, we need to integrate – joyfully and fearlessly. One can expect as well that the reduction in fuel costs will have a beneficial impact on the development of remote areas and the world economy on a whole. The price and consumption, as paradoxically, may increase. At the third state - to create a world system of Russian World - Russian (trilingual) city in all parts of the world (education, military service, science, culture) - “The Golden Horde”. God With Us – To work, comrades! Basic list of inventions and developments for comprehension of ideas and design. 1.Буков. А.А. Масса вакуума и масса вещества. Закон всемирного выдавливания. 2.Букреев.В.С. Структура эфира. Природа электричества. 3.Трофимов.Г.В. Строение атома с позиции корпускулярного представления о фотонах. 6.Понуровский. А.А. Способ и устройство получения энергии с выделением холода.